Proprietary Computer interfaces differ from the popular and well-supported mainstream Comercial offerings by in a number of ways, but the key differentiator is that these interfaces typically implement custom communication and feedback techniques and protocols that are not necessarily compatible with the NMRA DCC standards. There are two fundamental ways you can interface a model railway to a computer: either via direct connection or alternatively via an indirect Interface. Direct Interfacing means running a wire from where a signal originates to where that signal needs to go. Naturally this method uses a great deal of wire, but is easy to understand. Indirect Interfacing uses some kind of multiplexers between source and destination. For example all sensors on a baseboard are directly wired to a multiplexer and a single wire is run to the control panel where a demultiplexer feeds the lamps that the sensors needed to drive. RPC is one example of an indirect connect implementation. For inputs, sensors and buttons connect to SRI4 modules and track circuiting is handled directly by FTC modules. The RPC stack is a shift register which multiplexes all the inputs onto a single wire and to some kind of demultiplexor which might be a PC, or perhaps an SRO4 module. Outputs from the control logic are multiplexed and sent to output modules on the RPC stack (SRO4, or DPR modules). Most wiring (except track feeds) can be replaced with a single multiplexed line. Tracing through faulty connections is simpler. 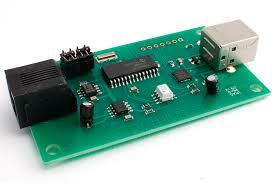 Rewiring (to re-route a signal to a different location) can be done in software or firmware. Sending signals to multiple destinations, or performing some kind of logic on them (eg. anding two lines together) can all be done in a single programmable device. Signals can be sent further without degradation or noise pickup. Suppliers of indirect connect interfacing hardware. Please note that these are not the only companies that supply interfacing hardware and the hardware mentioned here may well be replaced by the time I ma finished typing..you are advised do a search for other companies/products and to not blindly purchase any product mentioned here. I simply chose to these companies as I have experience with their products. QtuTrains supply various kits and modules. QTUs can be mixed with RPC modules (see below) and have I/O to the same specification as RPC except that each QTU can be equipped with two slow-motion turnout motor drivers, has eight analogue inputs and four track drive outputs. The QTU can be configured to run as manual throttles, autonomously (runs a program downloaded into it) and also to run as a computer interface board. The Merg RPC kits meets most of the railway interfacing requirements for most of us. The kits are relatively cheap, and physically compact. The RPC system is based on a shift register design and adjacent modules are connected by four signals and power. These signals are transmit data, receive data, clock and load. These signals are TTL compatible (short distance only) and are used to interconnect and control the shift register. It is easy to design and build your own hardware (or software) to drive an RPC stack. The modules that are available from CTI are similar to the RPC units in capability, but are ready built and naturally cost rather more. The modules are connected in an RS232 loop. This has some advantages over the TTL signals used by RPC, especially that modules may be placed a fair distance apart (several metres). As a message circles around the loop each module receives one byte from the message, and relaces it with its input values (if it has any). As the CTI system uses RS232 (9600 baud standard) any hardware with an RS232 interface can be used to build your own modules. If you conform to the message protocol (fully documented on the web) the CTI application software (or my tcc application) will treat your hardware as if it were actually CTI modules. The modules are all much bigger than the RPC equivalents, and cannot be stacked adjacent (for example the trainbrain module has connectors on three of its sides). They each need a separate power feed cable and links to the adjacent modules. This is the basic interconnect module providing 4 inputs and 4 outputs. The inputs are similar to the SRI4 module for RPC in that the signal connects directly to 5V logic (actually a PIC chip) with pull-up resistors. Three different plug-in pull-up resistors are supplied so you can chose the best for your sensors. This is useful with LDRs (Light Dependant Resistors) so you can match the resistor to your supply of LDR. The outputs are SPDT (single pole double throw) relays capable of switching 10 amps. This makes them suitable for controlling solenoid motors (simply connect between a CDU and the motor).